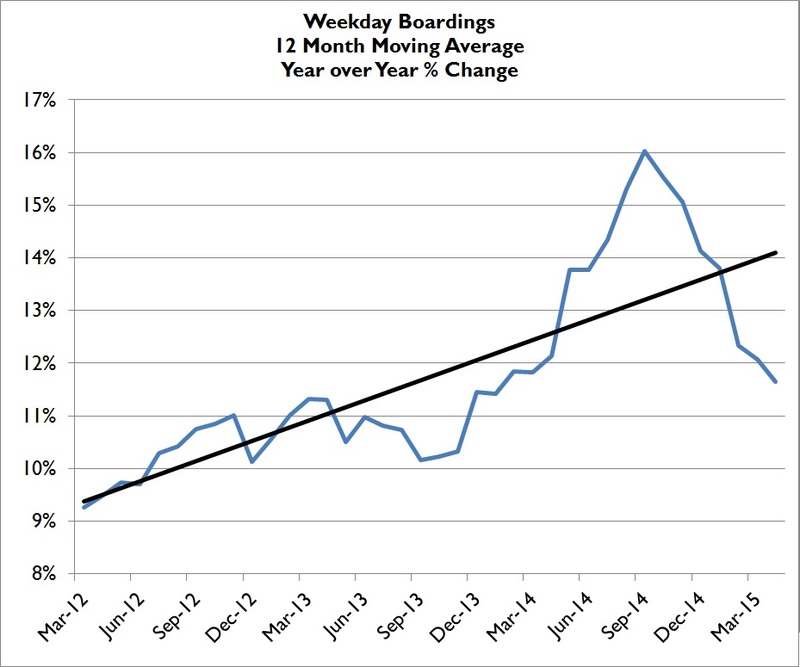 Last month I asked if Link was pulling out of it’s late 2014 ridership growth slow down. While it hasn’t returned to the insane 15+% gains of last year, it does appear to have bounced back to more than healthy levels. Throw out the February numbers (unusually low due to the Seahawks’ parade inflating 2014’s numbers) and Link’s ridership is averaging 9.2% growth for the year. That itself is pretty remarkable when you consider it’s following on the heels of 13.4% growth for the same three months (January, March and April) last year. April’s Link Weekday/Saturday/Sunday average boardings were 34,034 / 24,777 / 19,603, growth of 9.5%, 3.7%, and 13.3% respectively over April 2014. 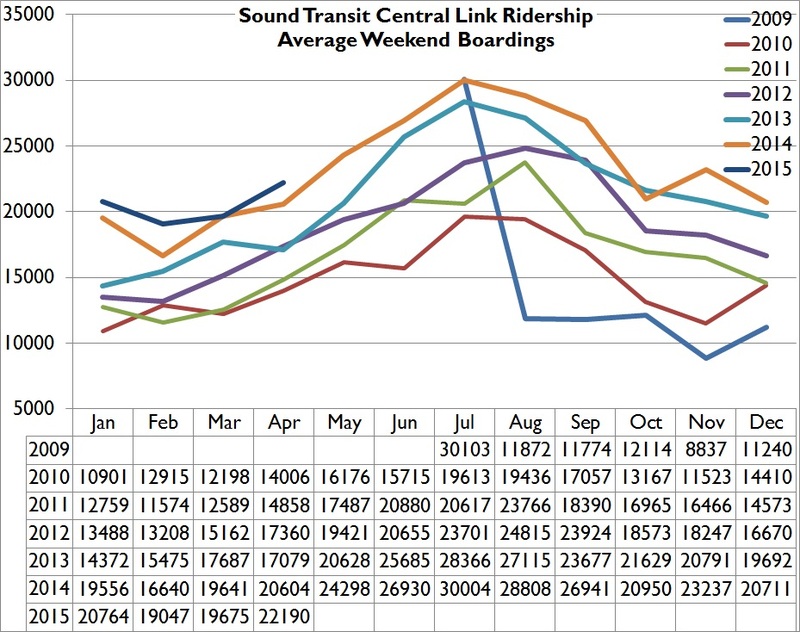 Sounder’s weekday boardings were up 6.1% with ridership increasing on both lines. Tacoma Link’s weekday ridership increased 2.1%. Weekday ST Express ridership was up 5.8%. 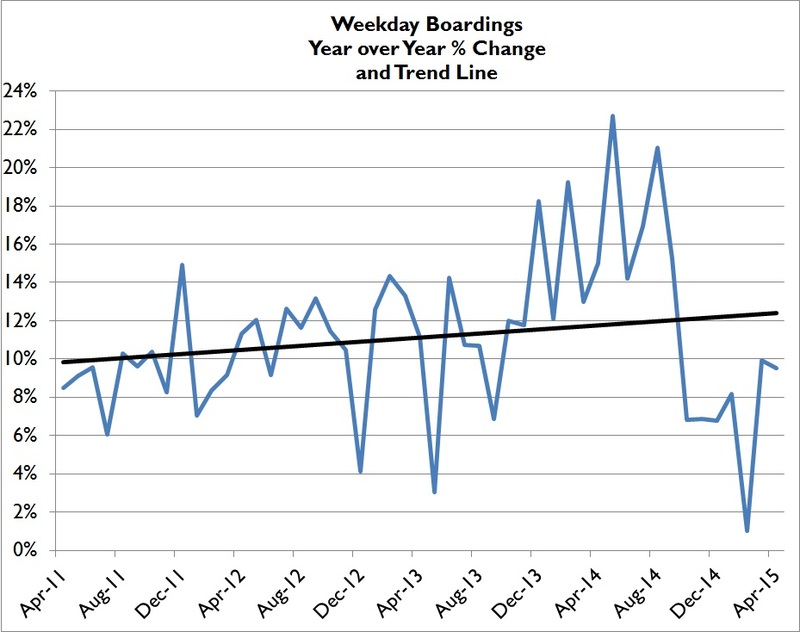 System wide weekday boardings were up 6.8%, and all boardings were up 6.7%. The complete April Ridership Summary is here. My charts below the fold. Any luck getting station by station numbers? I’m curious if the growth is across the board, or coming from one area more than another. I’ve got the station by station light rail numbers posted in raw data files from Sound Transit down below on my PITF ridership page at http://www.bettertransport.info/pitf/Linkpassengercount.htm. I haven’t had time to do any displays based on them. Cool, thanks (found the info on your web page). Yep. ST got me last year’s numbers, which I’ve plugged into my spreadsheet but haven’t had a chance to analyze yet. Look for a station boarding post in the next week or two. Thanks. I think it would be interesting to see if there are any trends as well (compared to a few years ago). Specifically I’m wondering if numbers in Rainier Valley are picking up substantially. Interestingly Sea-Tac Passenger traffic increased 13% from last year. Click on Current and Historic Traffic and Operations Statistics and download the Excel spreadsheet for April 2015. I recall a FTA report from the early ’90s when decisions about serving SeaTac were being discussed. It basically said that roughly 5% of passengers used rail to reach airports nationwide. Looking at your numbers and SeaTac Link Boardings, that sounds pretty close to what we are seeing. As I recall, that’s how Southcenter/Tukwila got bypassed in favor of speed to the airport, albeit slower than the 194 it replaced on most trips. Similar decisions are currently being made for ST3 regarding station spacing v. speed to Tacoma or Everett. I would be fascinated to find out what percenatge of the airport passengers are heading for the University of Washington. It might be a significant percentage. If so, airport station usage might jump when the U of W and U-District stations open…. at least during the specific times when the University starts, finishes, or goes on break. Ridership is up across the board. 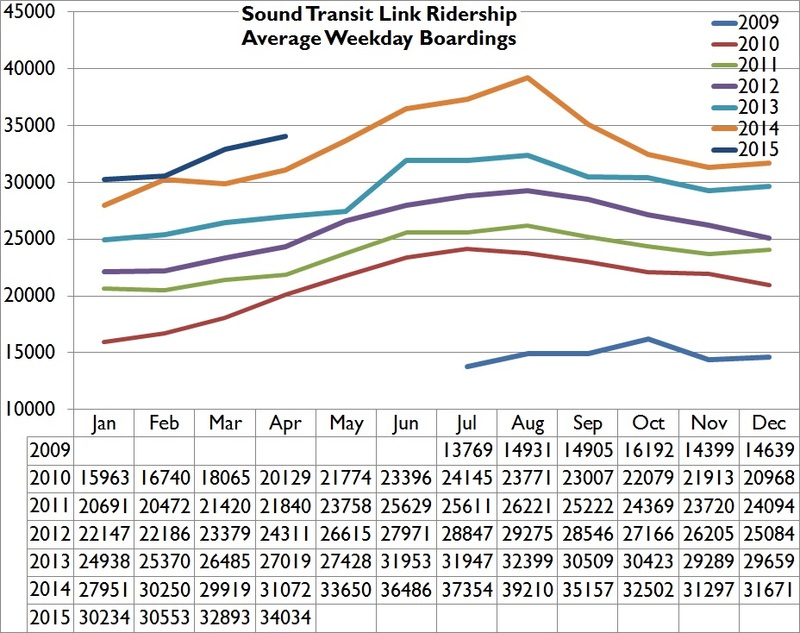 Sounder, Link and Express buses are all doing quite well. The express bus numbers surprise me a bit. I would have expected some of the buses to be fairly full by now, and thus see ridership leveling off. I find the “passengers per trip” to be the most interesting metric. Riders per month is fairly abstract, to me. But Link carries around 125 people per trip, while the express buses is now over 40 and Sounder carries over 500 per trip. This is very much apples and oranges (the express buses and Sounder are geared towards commute times) but interesting to me nonetheless. It does make we wonder how much of the growth is during rush hour, and how much is outside of it. I could easily see Link really increasing its numbers just by getting a few more people outside of rush hour. Anyway, the numbers will explode once Link gets to the UW. 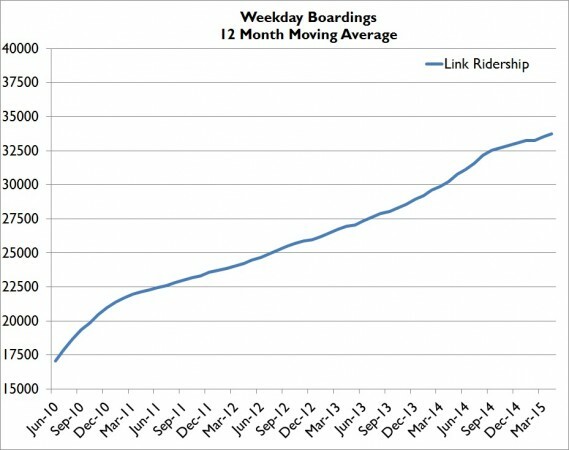 Not only will Link surpass Express (an apples and oranges comparison to be sure) but the number of riders per trip will really take off — probably double. At least, that’s my guess. Do you think every 7x bus rider will then take LINK? My guess is, it depends on how many routes actually end at the Link station until 45th opens. There’s a big difference between forcing a transfer and one that involves choice. Personally, I would stay in my seat if at Campus Pkwy my choice was head for downtown when the doors close, rather than slug it out to Montlake, take a tortuous walk to a train platform and wait 3-5 min avg for a train. Of course, if I’m going past IDS, then it’s a no brainer to get on Link early on. Yes, with room to spare. A bus every 7 minutes fits 100 people squeezed in. A 2-car train every 7 minutes fits 300 people, and a 3-car train 450. And they’ll be overjoyed to have the fastest no-traffic I-5 travel time reliably all the time. The one bummer is it won’t go to 45th yet, which will make some people grumble and a few not use it. But those who take the 7x regularly will be glad to get rid of the random slowdowns and crowding and cash fumbling. Yes, what Mike said. The U-Link section is weird, because it only covers half of the UW area (lower campus and the hospital). This makes it awkward for bus interaction as well as a long walk (or a transfer) for a lot of people in the area. But Metro is doing an aggressive restructure to take advantage of Link, and a lot of people are used to walking around there (it is a campus). I think it will be extremely popular, and could be more popular as the various agencies in charge deal with connecting it to both other buses (from every direction) and bike riders. I expect another substantial bump when Link gets to Northgate, as arguably our most important non-downtown station is added (U-District, which also serves upper campus). I would prefer to see closer to double that riders per trip metric. Lets say you have about 100 pax capacity per car (it’s more with crush loading, but everyone hates crush loads). You have at least 200 capacity per trip, if everyone was riding from one end to another. If you had 125 passengers ride halfway, and exchanged with another 125 passengers at the halfway point, and they continued to the end of the line, you get 250 per trip. To me it seems like this points to limited numbers of people using Link to get between bus routes. I understand some of the reasoning behind the way Link was designed, but there are an awful lot of busy bus routes that should see more transfers. Looking at the raw numbers that John downloaded and posted on his site (see link above) I’m not sure if you can conclude anything about transfers. But it does appear that folks are riding Link mostly end to end (or close to it). For northbound riders, the four downtown stops dominate as the destination (around 2/3). One outlier is Mount Baker, which as a destination for northbound riders is more popular than other non-downtown destinations by a comfortable margin, even though its overall boarding/alighting is about the same. So it stands out as a stop that is linked almost as much to the south as it is to the north (making it unusual). I’m guessing that a lot of folks are taking Link from one end of Rainier Valley to the other. Bus connections might have something to with it, or maybe people just take it and walk.Either way, though, it supports the idea of a Graham Street station, in my opinion. My guess is that most bus transfers occur at Westlake, and a substantial number of those occur in the tunnel. A lot of those go away, and will be pushed out to the UW soon. The Mount Baker station redesign wih improved transfer ability could make some positive changes there. Not sure what could be done to Beacon Hill, other than some really expensive changes. There’s a pretty busy bus route at the top though. Where I live that type of bus route dumps a lot of passengers into the train. It seems like it should be doing better, but it is also Avery long transfer, and there’s no real way around it. I sometimes use Beacon Hill Station as a “transfer point” with Car2Go when traveling to and from the airport. I’m hoping that when Link extends to the UW, the time penalty of taking transit all the way will be a lot less egregious. (And if you’re wondering – why make the Link->Car2Go connection at Beacon Hill Station, rather than downtown – it’s because the trip, for me, is usually in the evening, when downtown has no Car2Go’s available). I think the zig-zag nature of Link works against great bus connections for Beacon Hill. If I’m at MLK and Jackson and headed towards the airport (or Tukwila) then taking a bus south to Mount Baker and then riding Link makes a lot of sense. But if I’m at 12th and Jackson, I’ll just head to I. D., instead of Beacon Hill. Meanwhile, if at the V. A. and want to head to Othello, I’ll just take the bus south (rather than take a bus north and then transfer). I don’t see a lot of combinations where Beacon Hill makes sense. South of there (e. g. the V. A.) to downtown, certainly, but even then it is fairly close — the convenience of just staying on the bus saves time over getting on the train, unless you are headed to the north end of downtown. If you are north of there and headed to the airport, then certainly a transfer makes sense. But if you are headed to downtown (where most people are headed) then backtracking (heading towards the station) never makes sense (just go north). I think there are probably a lot of transfers going on, its just that most are occurring where they have traditionally occurred in Seattle: downtown. I’d also like to see a station by station breakdown. I have the airport stop at number 3 or 4 with Westlake at 1 and tukwila at 2. Othello seems pretty healthy too. But I rode on a weekend so not sure how to extrapolate. With the burbs online the airport station will prove a worthy station, contrary to some of the crud I read on here. i’m wondering if I can go an entire post without a OCD spammer tagging me. Yes, same in Sandpoint. U station is going to be huge for getting to the airport. Westlake, SeaTac, I. D., Tukwila, University, Pioneer Square, Mount Baker, then Othello. This is weekday only, February to June of last year. SeaTac and Tukwila make up a substantial portion, about the same as the Rainier Valley stops (depending on whether you count Beacon Hill or not). But downtown dominates (of course) making up more than a third. Westlake and SeaTac are huge compared to the rest of the stops, but it is fairly spread out after that — there isn’t much difference between Tukwila and Othello, and not that much difference between Othello and Rainier Beach (the smallest one in Rainier Valley). I think you should expect to be extremely disappointed when the broken-out station data show your sprawl-rail fantasies to be utterly unsupported by reality. I guess expecting to not get tagged by an ocd spammer is like expecting a baby to not crud their diapers. Its coming and its noxious. I’d rather indulge in OCD than celebrate perpetual idiocy. The airport is big, but it doesn’t dominate, like downtown does. For southbound trips, Tukwila and SeaTac represent almost half or the alightings. But it is still less than half (around 45%). For northbound, the four downtown trips (which means I’m not even including Stadium or SoDo) represent well over 2/3 of the trips. In other words, almost everyone headed north is headed downtown, while a substantial number (but still less than half) of the folks headed south are headed outside the city. Intra-downtown trips are significant. Not huge, but significant. Over ten percent of the riders ride the train between I. D. and Westlake. I’ve said it before and I’ll say it again: the bus tunnel was a great value. Boardings and alightings at SeaTac and Tukwila don’t match (none of them do) but the combination is a closer match than the individual stations. This suggests that a lot of people transfer to nearby buses, or walk from whatever station they feel like walking to. I’m thinking that a lot of people work in the area (e. g. cleaning motels). Following up on that: Tukwila is not the “pure commuter” suburban run that folks might expect. Northbound, about 40% are in the morning, 30% midday and the rest in the afternoon and evening. I’m guessing some of this is workers, while some of it is people going into the city for entertainment. Of the stations south of SoDo (arguably the non-downtown stations), Mount Baker has the highest proportion of northbound alightings versus boardings. The same happens in reverse as well. Maybe a lot of people from Mount Baker are headed to the airport, but I think this is one of the few areas where people use it to get from neighborhood to neighborhood. I could see this — if you want to travel Rainier Valley, it is a reasonable choice. I only use Link to go to and from the airport, starting/terminating at Mt. Baker. From there I uber home. For an all-in cost of $23-$28.50 depending on whether I travel alone or with my partner (in he latter case, cost = $14/person), it can’t be beat. Plus, the door-to-door time approximates 45 minutes from when I step out of the terminal, which is very competitive. 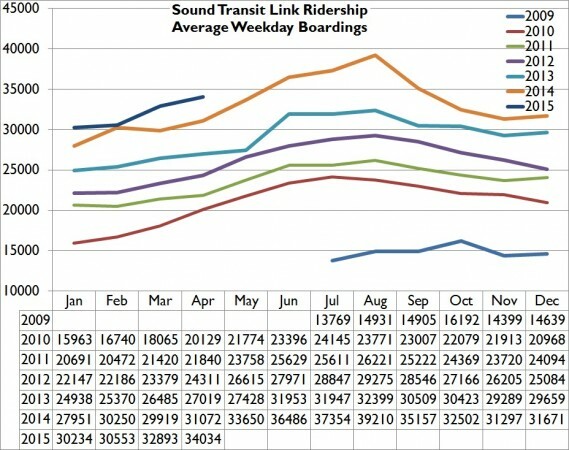 Visitors are still learning about Link, so I would expect ridership to continue to grow nicely from Sea-Tac. This is the way ST needs to think when designing future expansion plans. Right now, there is NOTHING on the board that would cause me to consistently use Link for any purpose beyond initiating/ending a trip where I must fly. Not bad, considering it only really serves downtown and the airport. What’s the farebox recovery when you add in capital costs? 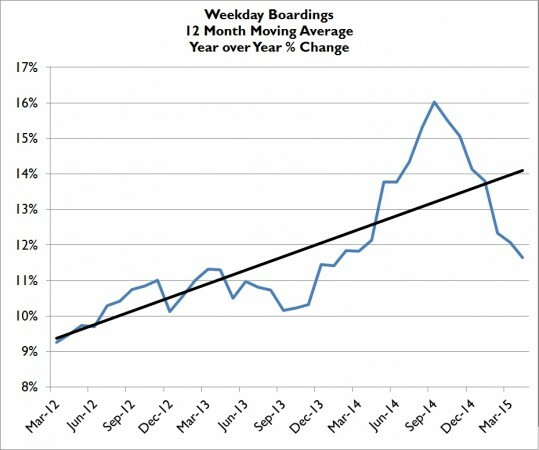 Thinking long-term, big picture, the real surprise for me in light rail ridership to date has been the strong, on-going seasonality, clearly shown in the PITF updated graph at http://www.bettertransport.info/pitf/Linkpassengercount.htm#weekdays . Anybody care to predict how much that pattern will smooth out after the three new stations open in 2016? It’s not that surprising. The airport generates a lot of trips and is significantly busier in the summer; downtown Seattle tourism is strongest in the summer; the Mariners sell a lot of tickets (baseball, thanks to its multitude of games, is still the most-attended pro sport in America). I think I saw a chart showing Metro’s seasonality as quite different from this, with a summer drop-off and fall peak, because Metro overall serves a lot of school and college ridership. U Link will add trips to and from UW, Seattle Central, and probably some involving Seattle U… as it adds coverage its seasonality will look more like that of other services. Roger copy all you are saying…not surprising looking back and knowing what we know now. What’s interesting to me is that nobody (to my knowledge) wrote that they thought this oscillation would be the Link ridership pattern in the years before it opened, or even through the spring-summer of 2010 when Link ridership was escalating month by month. Note the old green forecast line over on the left side of my chart at http://www.bettertransport.info/pitf/Linkpassengercount.htm#weekdays You can see the optimism bump that was reversed when reality set in. There was unbridled optimism in the summer of 2010 at ST that the spring-summer ridership run up just having occurred would go up, up and away. Did anybody make the call that ridership would turn down in autumn 2010 (beginning the seasonal oscillation pattern) before it actually happened? I sure didn’t. With this history in mind, I find the optimism today about the ridership supposedly forthcoming on U LInk to be equally fascinating — I enjoy the confidence expressed above, “the numbers will explode once Link gets to the UW.” A few months ago a Sound Transit staffer told me at the back of the Fisher Boardroom how he didn’t get why I didn’t grasp the huge ridership that light rail would see when Husky Stadium and Capitol Hill opened. I’m uncertain because of history. The light rail rider number of interest to me is 105,000 per day, the forecast made in 1996 to justify Central link between NE 45th and S 200th by 2010, pretty much the train that will open in 2021 except that it’s costing twice as much money as planned and taking twice as long as expected to build. And then Northgate is open also, and what happens — the ridership will mega-explode and four car trains won’t be big enough in peak to carry the crowds? No chance of that, right? Just wait The two car trains in service now are full. They can’t run three or four car trains for a couple more months because thats when they’ll be ready to test the university link service. Trains will run empty through capitol hill to the u district until it opens. That will enable three car trains. Which will be nice. The recession hurt ridership but it’s definitely on the rebound now. John – No one cares about the 1996 estimates. Really. It time to move on, man. The politicians who made those estimates are long gone and the public passed an adjusted plan. You know that, but still harp on as if it means something. It doesnt. Anyone nodding along with you would never vote for any transit expansion. Link is probably going to hit that old 2020 estimate (or come really close.) I’m not sure what you dont get about connecting places with lots of people via fast service. I’m assuming part of what you don’t get is predicated on you not living in any of the connected places or riding transit. Your comments about the bump are silliness. 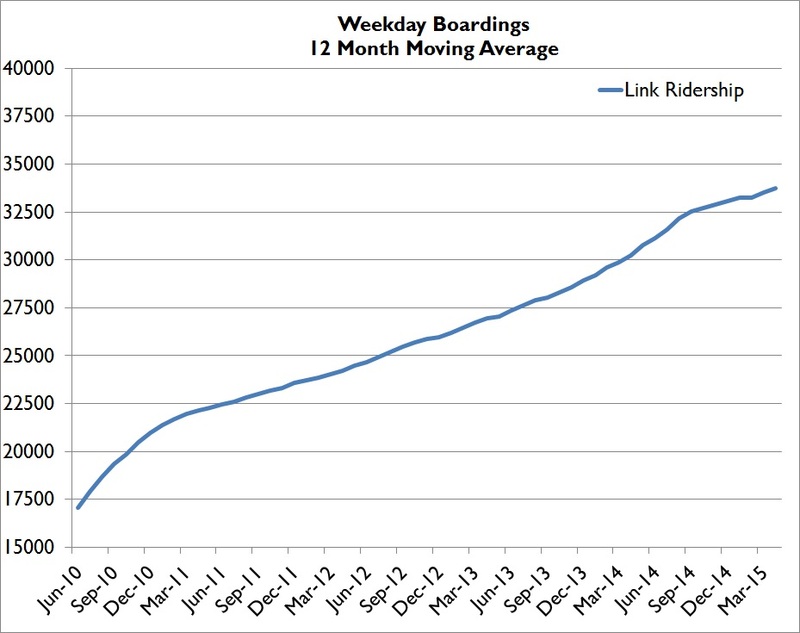 No one predicted the seasonal nature of Link ridership. So what? Ridership has recovered from the recession. Just like everyone was telling you during the recession. It’s the pent-up demand. People are frustrated with the 71/72/73X with ifs traffic slowdowns and overcrowding and pass-ups; they need a reliable way to get to class on time. They’re taking the 43 and 49 to Broadway because it’s the only transit option. These people will switch to Link in a heartbeat, and that will attract more people. That’s the reason for the explosion prediction. There isn’t any equivalent in the south end. Link is somewhat better than the 194 but not that dramatically better. People in Rainier Valley took a long time to get used to Link, and it geographically doesn’t serve some trips such as Rainier/Othello to Rainier/Edmunds, or Rainier/Edmunds to Rainier/Dearborn. A lot of the trips in Rainier Valley are intra-valley, while a lot of the ridership in the U-District and Capitol Hill is bypassing the road barriers and bridges and cogestion that the buses get caught in. Yeah, what Mike said. It is a bigger improvement in mobility. But it is also just the case of more people — a lot more people. The Rainier Valley has people, but nowhere near as many people as Capitol Hill or the UW. Having only two stops (neither one of which fits well with transit) will lower ridership a bit, but it will still be a lot bigger than what we have now. Right now our biggest station is Westlake, with around 6,000 boardings a day; it wouldn’t surprise me if both stations exceed that. I actually expect you’ll see that number, though Seattle seems to have a slow uptake curve so it might not happen immediately in 2021. Hi John. Here’s a link to my own ‘snapshot’ of Link weekday ridership showing a consistent oscillation pattern since service started. 1. MetroKC weekday ridership (divided by 10) bears little resemblance to Links patterns. That will change over time, becoming more similar in seasonal fluctuations. 2. The solid red line shows the initial segment only through 2020 (excluding Ulink). The blue line met the red line last August and will see a big increase next year. 3. The Orange line shows various ‘tweaks’ to yearly SIP projections of ridership over the years. 4. The green bars are the latest estimate of total Link ridership though 2020, topping out at 70,100 by 2020, or about 67% of original estimates for the year 2010 you mentioned earlier. So, with all that said and done, I predict Link oscillations will be cut in half, and ST is getting pretty real about meeting ridership projections, so the green bar is probably damn close, depending on what Metro finally does to feed Ulink and CapHill. It’s been a while, but my note shows the PSRC TIP submission in 2006, pg 10 and 14 then worked back at 3% per year till I found supporting data from the TIBS submission or 6 year plan. Mute point after next year, but interesting to watch ridership grow rapidly to approach original estimates. The Before and After Study was in defensive mode in the early years, but now I would love to see some credible ’cause and effect’ info how ST has been getting 10% a year. Household growth and employment growth at sites near light rail stations is my theory for why ridership on light rail grows. I’m hoping somebody besides me will take apart the station boarding/exit report data in a definitive way. A discussion seems to have started here as some looking into them is going on. At least we then find out which stations are seeing the most growth. First basic task would be to reconcile the station boarding reports with the ridership count reports.